The US-led airstrikes against Syrian government forces were in a sense “the best strikes possible”, having led to limited damage and limited response, believes Crisis Group's MENA program director and Valdai Club expert Joost Hiltermann. However, one should also be aware of the danger of escalation absent efficient communication channels. 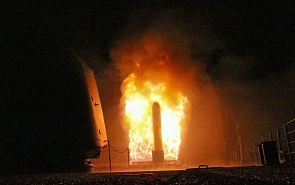 How will the international community and Russia react to Saturday’s missile attacks of the US-led coalition on Syria? Due to the fact that the strikes were limited to Syria’s chemical weapons infrastructure and did not extend to other targets, such as the Syrian regime installations or government offices or Russian military installations, the fallout of the strikes and the response are also going to be limited. Without supporting the strikes, it can be said that these were the best strikes possible. Trump can say that he showed American military might more than he did a year ago, when he struck an airbase; the Pentagon can say that they prevented escalation with Russia, which is important to the military leadership in the United States; Russia can say that none of the targets hit was within its areas of operation; the Syrian regime can say that Bashar Assad is still in power and just thumbed his nose at the United States. As usual, the only ones who did not gain anything were the Syrian civilians. How will these airstrikes affect the situation within Syria and the peace process prospects? That is a good question, because, although strikes are generally not good for obtaining peace, every event can be turned into an opportunity. The strikes do create a new situation and if the US administration were very smart about this, they would not just carry out military strikes, but also use them in order to resume diplomacy on the two areas where the United States and Russia agree. One is chemical weapons proliferation: neither side wants it in the region or globally, and the other is political process: the United States could try to re-engage and move forward. Could this conflict escalate into open confrontation between Russia and the United States? It could ­– and we should be aware of this danger. Wars are sometimes started by aggression, but often by mistake, accident, misinterpretation, miscommunication. What is key to prevent it from happening is to have very strong communication channels. As I understand, in case of this attack, the French government has said that it communicated with the Russian government about the attack beforehand, just as Americans did a year ago. Then everybody, at least, knows what is coming and you have limited damage and, most importantly, can prevent direct confrontation.